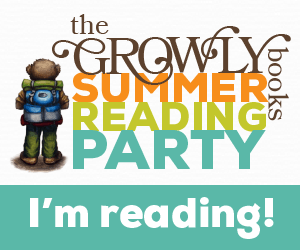 join us for a summer reading party! It’s summertime, and if your family is anything like ours, you’re seizing every opportunity to enjoy outdoor fun and activity. At the same time, you’re looking for fun ways to encourage your children to keep reading through the summer or to read together as a family. An adventure with Growly and his friends is a perfect way to do that! So we decided to have a Summer Reading Party! Join us for a fun-filled reading adventure this summer! The party will take place July 1-August 11 (six weeks). You can jump in any time before August 11. It’s easy to participate! 1. Sign up using the form below. 3. Read along with us! We’re keeping it easy . . . just 6 chapters a week (and they’re short chapters). You can read one a day or all at once . . . whatever works for you and your family! You can read it with your children, or they can read it on their own. If you’ve already read the book, you can still join in to get the freebies, answer the weekly question, and be entered in the giveaways! 4. Enter the weekly giveaway!! We’ll tell you what the giveaway is in that week’s email. Entering the weekly giveaway is simple! Just answer the question that you receive in your weekly email (one entry per family allowed). When you submit the correct answer, you will be entered into the giveaway for that week AND the giveaway for the iPad mini at the end of the reading party. Miss a week? That’s okay. We all know it’s a busy time of year. Just join in as you can! Each time you submit a correct answer to the weekly question, you will automatically receive an entry into the iPad Mini (16GB) grand prize giveaway. If you only answer one week’s question, you’ll receive one entry. But if you answer the question every week, you’ll receive six entries! All winners will be chosen randomly. Giveaway winners will receive a notification email and will be announced here on the blog. Winners have 72 hours to respond, and if the winner does not reply within that time, another winner will be chosen. Are you ready to get started? Signing up below will add you to our reading party list to receive the special weekly emails as well as our blog email list for all the Summer Reading Party news! If you are already subscribed to our blog, please note that you must still sign up via this form to receive the weekly party emails. We’ve already received reports of children drawing characters from the book, and it’s just so fun to see! If your child(ren) would like to have their art featured on The Growly Books blog, they’ll have a chance to this summer! Details coming soon! Keep up with the latest Growly news and help spread the word on Facebook! We hope you’ll join the fun! !